Tiger Oil specialise in Kerosene Oil, Marked Gas Oil and Diesel. We have been operating out of Drogheda for over 30 years where we have served the local community with quality service and reliable experience. Our continuous commitment to providing our customers with a premium service is unrivalled. We offer competitive pricing on all our products. 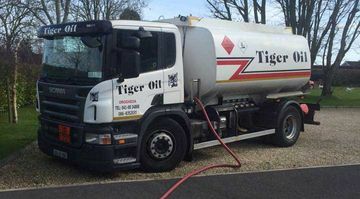 Let Tiger Oil take the stress out for your next oil refill with our expertise and consultation service. Kerosene oil is for home heating purposes and is the most competitive heating oil available. This is the most popular form of home heating oil in Ireland. At Tiger Oil, we are the only supplier in Drogheda to offer a “fill your own” service for Kerosene Oil. Marked Gas Oil, also known as green diesel or agricultural diesel, is primarily used for home heating purposes but is also suitable for use in tractors. Marked Gas Oil is the most popular alternative to Kerosene Oil for domestic heating as it is cost efficient, clean and safe. We supply road diesel (DERV) to commercial and private vehicles throughout the greater Drogheda area. Why not call us today to see how we could serve your oil needs. We offer a full delivery service for all our oils as well as operating an oil yard at our base in Drogheda where you can purchase 20l drums of Kerosene. Tiger Oil guarantees next day delivery, and in most cases will deliver you oil that very same day. Let Tiger Oil take care of your oil needs, give us a call.